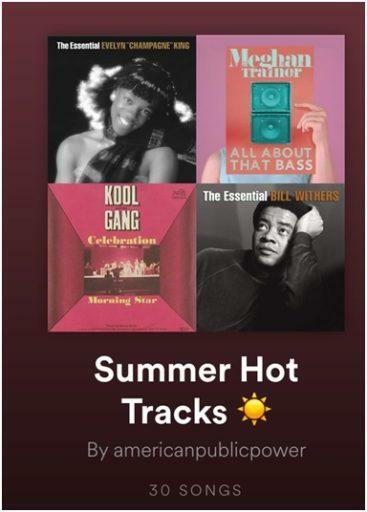 It’s time to cool down with these Summer Hot Tracks on the American Public Power Association Spotify playlist! Click on the cover to tune into 30 of the hottest tracks from some of the hottest decades in music! While you’re rocking and chilling out to these hot tracks, be sure to check out the Efficiency Top 10, brought to you by PES’s rocking DJs.These Summer Energy Saver Tips offer you such chart-toppers as “Circulation” by Cool & The Fan; “Change Me” by The Dirty Filters and the bonus track “Energy Stars” made famous by New Appliances on the Block!